Shaun is a clever, mischievous sheep who lives with his flock on Mossy Bottom Farm, under the nominal supervision of The Farmer and Bitzer, a well-meaning but ineffectual sheepdog. Despite Shaun’s best efforts, life on the farm has become a bit redundant, so he decides to concoct a cunning plan -- to have a day off. Biting off more than he can chew, Shaun’s mischief rapidly escalates out of control and inadvertently leads to the hapless farmer being taken away from the farm. Sheepishly, Shaun must leave the farm for the first time and stray into new pastures to rescue The Farmer. Along the way, Shaun meets a little orphan dog called Slip who teaches him that family is the most important thing in the world. Taking on the big city in their mission, the new flock on the block must use their wool power to blend in and bring The Farmer home - failure is not an option. Realising that the grass isn’t always greener on the other side, can Shaun and his friends pull the wool over everyone’s eyes and act human enough to escape the clutches of a fearsome animal catcher? An action packed adventure of wildly hilarious mishaps, Shaun The Sheep will have the whole family begging for more. Bringing the much loved television series to the big screen, Aardman, the four-time Oscar award-winning studio behind the likes of Wallace & Gromit and Chicken Run, have outdone themselves once again. The 'Shaun The Sheep' competition has now closed. Winners will be announced shortly. Competition opens at 5pm AEST on Sunday 20th September 2015 and closes at 11:59pm AEST on Sunday 27th September 2015. Five winners will be chosen at random on Monday 28th September 2015. To successfully win, entrants must fulfil the above entry conditions before the time the competition closes. Current members/followers are eligible to enter the competition. Only one entry per person. Only one winner per household. To be a valid winner, the entrant must not have won a prize from SWITCH within the last 28 days. Each winner will receive one Ultraviolet Blu-ray copy of 'Shaun The Sheep'. By entering, you agree to receive occasional emails from SWITCH in the future. If you decide to unsubscribe from these updates, any further entries will not be applicable. Only Australian residents are eligible to enter. 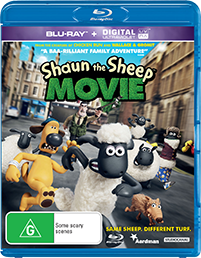 'Shaun The Sheep' is available on Digital, Ultraviolet Blu-ray and Ultraviolet DVD on Thursday the 24th September 2015 from Universal Sony.